I love chocolate. I love it because it tastes good, but also because my ADHD brain loves the temporary “hit” I get when I eat a piece. For years I have been buying 86-90% dark chocolate and eating 2 pieces per day. More on days when I’m stressed, or sleepy, or have some other excuse. The real problem with this is that it keeps me in a bad habit cycle, where every time I feel stressed I reach for the chocolate. When I really should be practicing what I preach and trying a one-minute meditation. So last week I was in the aisle where they keep the many varieties of chocolate. Coincidentally I had just read the quote above from James Clear. And guess what? I kept walking and didn’t buy my chocolate. Only one time over the weekend did I think about it and wish I had it. The feeling passed remarkably quickly when the trigger (chocolate) was not available. If I can create enough friction to change a years-long habit in one weekend, then so can you. Tiny habits are easier to form than big life-changing habits. It is also easier to break a bad habit than to create a whole new one. Here are some ideas for creating some habit-changing friction in your life. Another note I stole from Clear’s new book was about “priming” your space. Clear tells the story of a guy named Oswald who has a habit of resetting his living room every night. For example, if he is finished watching television he puts the remote back in its home, and then straightens the pillows on the couch. I do the same thing, except I go around priming my space so I can get out the door in the morning. Set the coffee to brew at exactly 6 a.m.
We are both “priming” to make our lives easier, later. And really this whole process only takes me like ten minutes. Check out my post on evening routines, where I go deep into prepping the night before. The evening routine primes your space so that it is easier to get out of the house in the morning. If you don’t have one, start creating one. If you find that Facebook or Pinterest is taking up more of your already divided attention, just delete it. Really, it’s not that hard to reinstall next week. It will be fine. You might be surprised how easy it is to get things done when you aren’t hyperfocused on your phone all the time. I guarantee that your phone and the apps on it are at least 50% of the problem when it comes to your ability to motivate yourself to get things done. Ignore all the advice about the best apps for productivity. The best, and easiest app I have found to date is not on my phone. It’s Alexa. Say for example you want to start eating better or lose some weight. Food and eating issues run rampant in the ADHD community. First, make a list of the foods that you think are holding you back or causing cravings. Then organize your pantry and start tossing. Need more friction? Put all of the food you are trying to avoid in a trash bag and put it in your garage. Or even directly in the trash. 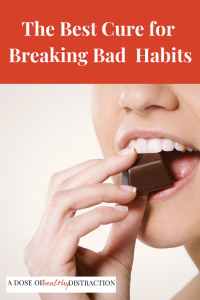 This all sounds a bit extreme, but with ADHD we need real friction to break bad habits. We think in very black and white ways, so removing the trigger eliminates the decision making part of it – it’s not even an option. I recently pledged to stop trying to “fix” you. So I must add here that this idea will not correct the neurochemical underpinnings of ADHD and your executive function issues. Creating friction is another tool in your toolbox. Here’s to creating new neural pathways! And disrupting old ones. Join my email list – my content is the intersection of ADHD education and inspiration! « Are you still wasting time on to-do lists?